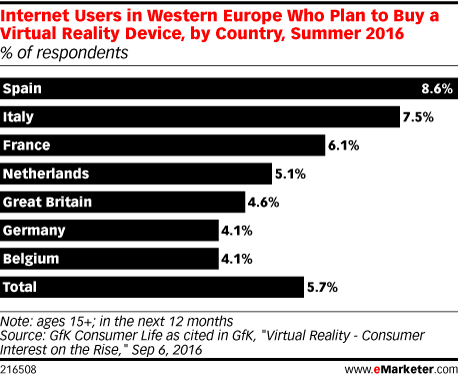 Data is from the September 2016 GfK report titled "Virtual Reality - Consumer Interest on the Rise." The report comprises 3 studies for 7 countries in Western Europe--Belgium, France, Germany, Great Britain, Italy, the Netherlands and Spain. For estimated sales of virtual reality headmounts for smartphones, data is based on GfK POS data during July 2015-June 2016. For estimated sales of action cameras, data is based on GfK Trends & Forecasting data from May 2016. Consumer survey data is drawn from a GfK Consumer Life online survey of 1,000-1,500 internet users ages 15+ in each country during summer 2016.